A video collaboration with the Audacious Young Women of Action from The Arab-American Family Support Center and TAKE ON HATE. We supported this beautiful and powerful display of resistance through dance, drumming, spoken word, and of course, projection on the steps of Brooklyn Borough Hall. We don't care how the administration tries to re-package the Muslim ban, we won't accept any of it! 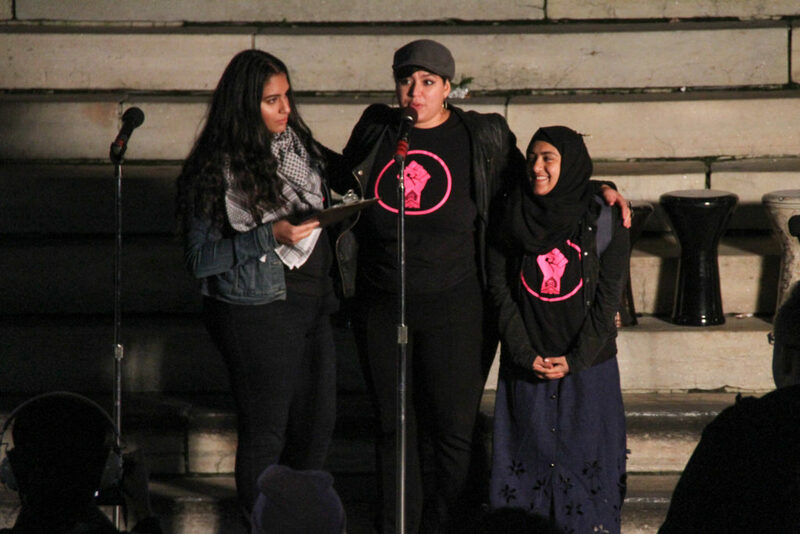 On October 16th, young women activists from the Arab-American Family Support Center (AAFSC) presented “Stomp Out the Muslim Ban!”, an art protest and dance rally at Brooklyn Borough Hall in response to the current presidential administration’s travel ban, then in its third iteration, targeting individuals from 6 Muslim-majority countries, as well as Venezuela and North Korea. 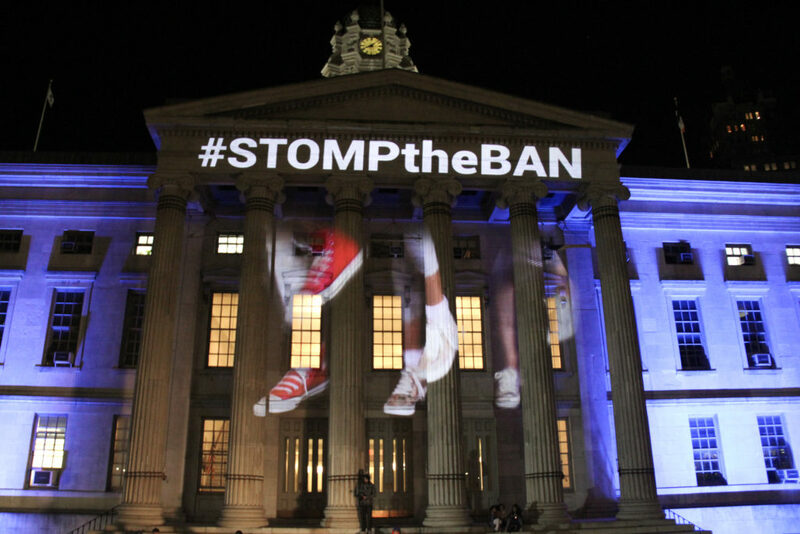 “Stomp Out the Muslim Ban!” featured a large-scale projection onto Brooklyn Borough Hall’s exterior of a video created by young Arab women showcasing dabkeh, a form of Arab step dancing. The video projection will be accompanied by a rally in which girls and young women are invited to share the impact the Ban and anti-Muslim bigotry has had on them and their communities. 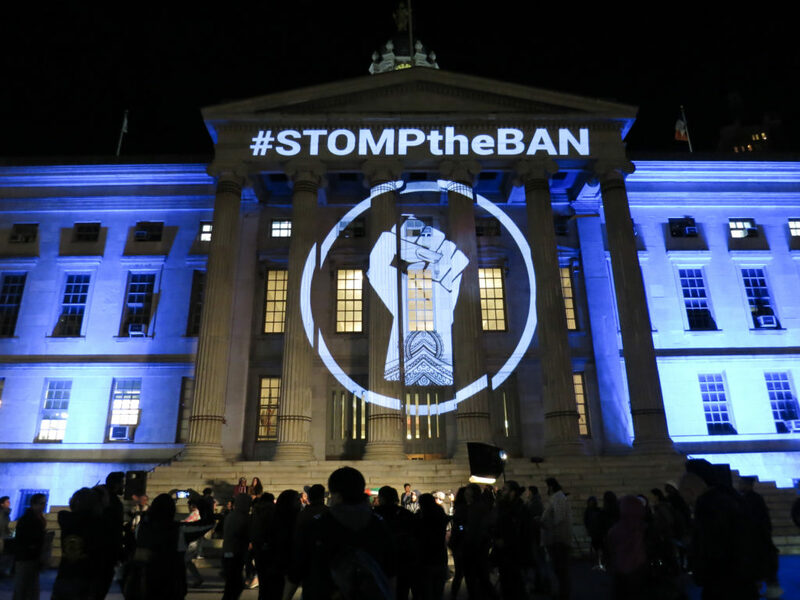 “Stomp Out the Muslim Ban!” will close with a performances from dance groups standing in solidarity against the ban, and a group dabke dance, celebrating Arabic culture while protesting bigotry. The event was held in partnership with the National Network for Arab American Communities (NNAAC)’ TAKE ON HATE Campaign and The Illuminator an art-activist collective. This event was in cooperation with the national #NoMuslimBanEver Campaign, a grassroots awareness and mobilization effort happening in the weeks leading up to and on October 18, 2017.